Though Apple has shunned the stylus in favor of multi-touch on the iPhone and iPod touch, a new patent application suggests the company is investigating superior handwriting and input recognition via pen. The patent application, revealed this week, describes a system that would comprehend complex "ink information" created from the use of a pen-like stylus. Entitled "Method and Apparatus for Acquiring and Organizing Ink Information in Pen-aware Computer Systems," the document includes multiple references to "tablet" style computers. The application even includes a reference to the company's previous stylus-driven portable computer, the Apple Newton, when discussing that current handwriting technology is inadequate for many users. "Even systems that attempt to improve this situation by using each stroke to determine the input field anew, such as the Apple Newton from Apple Computer Inc. of Cupertino, Calif., can suffer from failure modes that make the situation difficult for both end users and for application developers," the document reads. "For example, a word that accidentally spans two input fields even a tiny amount (due, for instance, to a stray ascender, descender, crossbar, or dot) may be broken up into multiple sessions, causing misrecognition and invalid data entries that must be manually corrected." The application goes on to describe a pen-based system that would include an "ink manager" to serve as the intermediary between the stylus input and applications on the hardware. "The ink manager interfaces between a pen-based input device, one or more applications (pen-aware or not) and one or more handwriting recognition engines executing on the computer system," the application states. "The ink manager acquires ink information, such as ink strokes, entered at the pen-based input device, and organizes that information into ink phrases." Included with the application is an illustration of a tablet-style computer. The design is very much similar to what rumors have suggested Apple's highly anticipated, still unannounced tablet device will look like. AppleInsider has been told the 10-inch, multi-touch device will be unveiled in the first quarter of 2010. 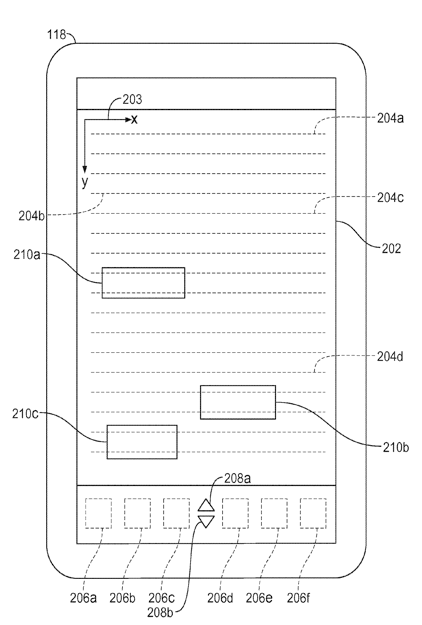 The references to digital ink in the latest patent application, filed in July of 2009, are similar to previous patent filings regarding a next-generation multi-touch input surface. Those documents also referenced the use of a stylus, but noted that pen inputs are typically not dynamic enough to address the needs of many users. The previous applications favored the use of fingertips, and described a system that would be able to understand ten individual fingers separately.